This place is near Pumpernickel and Mandela’s book-store. 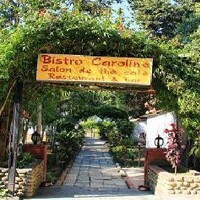 The sign for Bistro Caroline is huge but at 10ft high it takes a bit of finding. The menu has Malaysian section along with a mix of French and British. The seating is in the garden with glimpses of the lake.